ISLAMIC. Umayyad Caliphate. Time of Mu'awiya (AD 661-680). 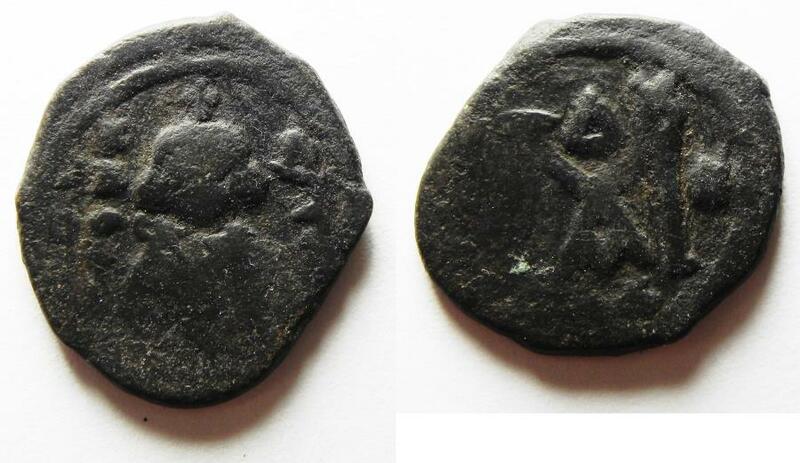 AE fals (21mm, 4.88g) imitating types of Constans II struck in AD 643/4. Antaradus (Tartus) mint. Beardless facing imperial bust / KAΛON to left, Arabic tayyib to r. / Large M terminating in T on left and OY on right; Δ above and A below; star to r. Walker -; Album 3525A; Foss 80; Bone 1.2. Very rare mint.